My two biggest passions in life are food and haute horlogerie with its new Grande Reverso Ultra Thin 1931, Jaeger-LeCoultre has produced a mouthwatering delicacy which encourages the potential wearer to savour its refined flavour. The dial is a rich shade of chocolate brown and confers a wonderful warmth, adjacent a gleaming pink gold case. The strap is presented in cordovan alligator leather, featuring conspicuous stitching which looks superb and harmoniously fuses with the rest of the watch. This all sounds rather splendid, but what makes this watch extraordinary is that it is a magnificent distillation of an icon, deserving of further discussion. In addition to those models listed above, there is another iconic name that shares equal celebrated status, the Reverso. The sublimely stylish art deco timepiece was born out of a functional need. British colonial army officers stationed in India expressed a desire for a watch which would be capable of surviving the harsh treatment encountered during a keenly contested chukka in the game of polo. The Reverso was the handsome outcome, with an ingenious pivoting case which, with a minimum effort, could hide the watch glass from errant polo balls and potential impacts. 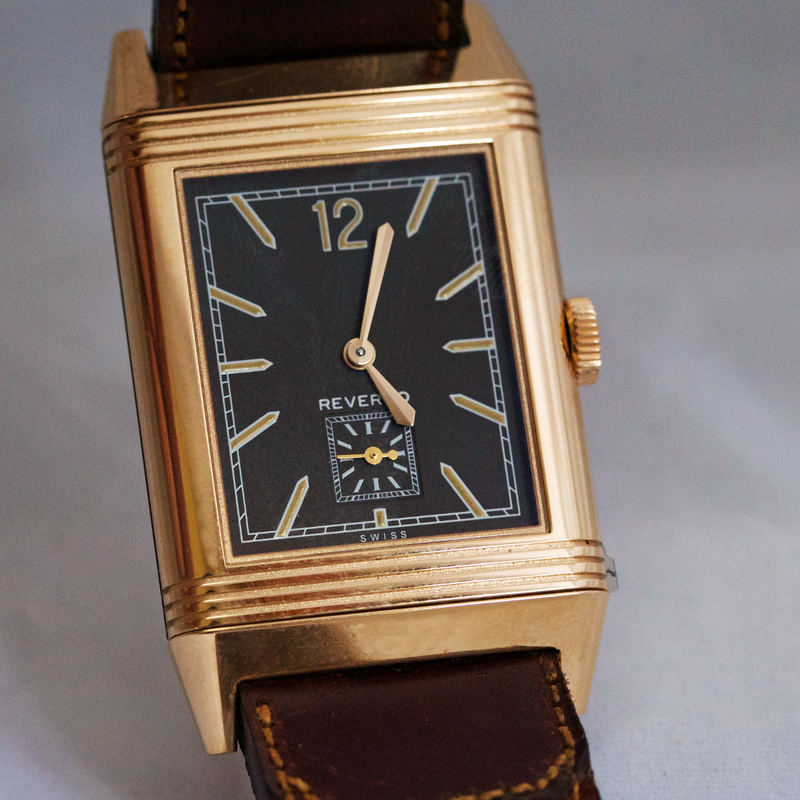 Since being launched in 1931 the Reverso has spawned numerous variants. Models have been produced in various sizes, incorporating different complications and have been housed in an array of materials. However, there has always been a consistent DNA which has tied all models together, namely the swivelling case. Moreover, whilst the watch design was created to be functional, its form has always exhibited a palpable quotient of finesse. A Reverso always says much about its owner. It exudes a quiet refinement not requiring overt flamboyant gestures to gain attention. I would liken its aesthetics to a natural beauty, sans make-up, whose fresh faced complexion is beguilingly attractive. Despite numerous iterations of the Reverso over its 80 year lifespan, arguably one of the finest examples of the model was released in 2011. The Grande Reverso Ultra Thin Tribute to 1931, produced to celebrate the 80th anniversary of the first Reverso, features a black dial and looks very similar to the original model. It also features, as the name suggests, an ultra-thin case, a regional speciality of watches produced in the Vallée de Joux. Later, Jaeger-leCoultre produced some avant-garde versions of the Grande Reverso 1931 with red and blue dials and, in so-doing, the company has doffed its hat to the “Années Follees”, the Crazy Years. A small number of clients selected timepieces with chestnut brown dials, similar in shade to this latest variant with its chocolate-like hue. Jaeger-LeCoultre released this brown dial version of the Grande Reverso Ultra Thin 1931 (reference 2782560) earlier this year at SIHH 2014. I looked at numerous watches during the annual watch fair and found many models engendered lust. However, a model at the forefront of my mind, and which I readily cited as a beauty, was this particular variant of the Reverso. The dial has a richness akin to a fine bar of Swiss chocolate with a high cocoa content. The gilt hour-markers all aim towards the centre of the dial, coaxing eyes subliminally towards the bâton shaped hands. Close examination reveals that the hour markers sit virtually flush with the dial surface, reinforcing the muted temperament of the timepiece. Unlike the Grande Reverso Ultra Thin Tribute to 1931, and subsequent Grande Reverso 1931 Rouge, this model incorporates a small seconds display, positioned above 6 o’clock. The small seconds display features a gold-coloured hand which interfaces with a small facsimile of the minute rail encircling the main dial. This particular aspect is delightful and confers much eye-appeal. Above the small seconds, the word “Reverso” is presented in capitalised, period font and quietly proclaims the nomen of the icon. Jaeger-leCoultre has chosen not to corrupt the clean appearance of the dial with the Manufacture’s name, a decision which was clearly wise and adeptly proves “less is more”. Framing the dial display is a minute track which follows the form of the rectangular case. It is both functional, aiding interpretation of the time and aesthetically very appealing. The brown Cordovan alligator leather strap is thicker than other straps I have seen on Reverso models. It has a robust character to its appearance, almost inviting use, once more, on a polo field. This is not a utilitarian strap, but a handsome aspect of the composition, delivering an abundance of eye-appeal. In particular, the contrasting stitching gracing the strap enhances the visual charm of this timepiece. Sometimes a beautiful veneer often lacks internal merit, but this is not the case when it comes to the Jaeger-Le Coultre Grande Reverso Ultra Thin 1931. The Calibre 822/2 has a degree of authenticity sadly lacking from some timepieces. This is a Manufacture movement in the truest sense, expertly crafted in the brand’s famous atelier in Le Sentier. Le Sentier is located at the heart of the Vallée de Joux, a region synonymous with crafting complicated and ultra-thin movements. Its legend is well-known to informed watch collectors around the globe. I have not seen an exposed Calibre 822/2 either on a watchmaker’s bench or courtesy of an exhibition case back. 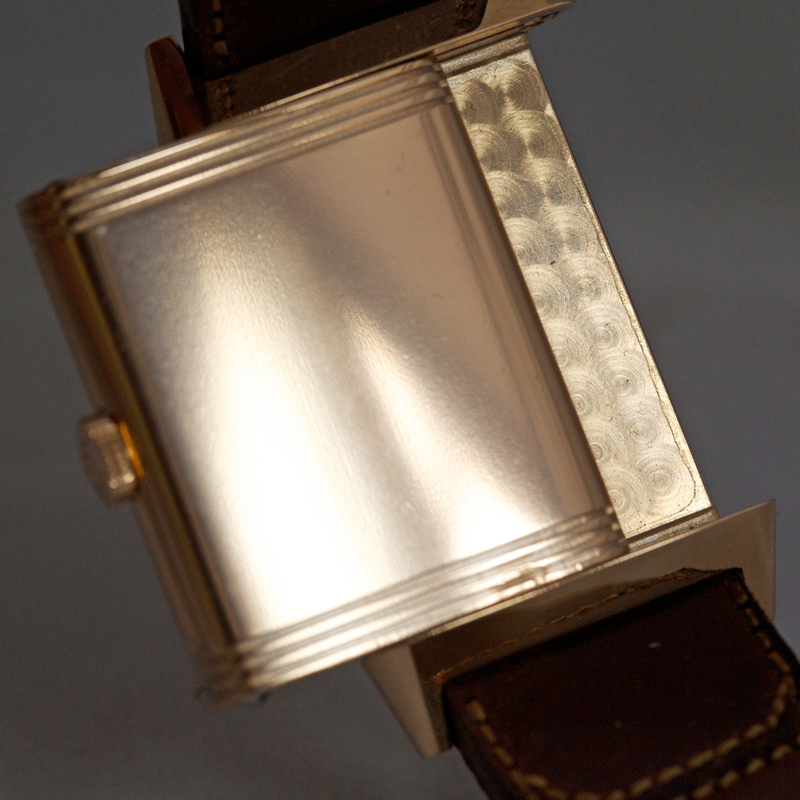 Indeed this Reverso watch has a solid case back, a detail I will return to later. However, I am familiar with the Calibre 822, on which the 822/2 is based. This particular movement featured within the Grande Reverso Ultra Thin Tribute to 1931 and the Grande Reverso 1931 Rouge. The Calibre 822 is a personal favourite, measuring a mere 2.94mm in height, yet incorporating a myriad of details within its svelte profile. The movement features a screwed balance, a tell-tale sign of high-end watchmaking. The bridges are adorned with Côtes de Genève motif executed to a peerless standard. The jewels sinks are highly polished and exhibit the same brilliant gleam on the bevels of the bridges. The case of the Grande Reverso Ultra Thin 1931 (reference 2782560) is pink gold. Measuring 46.8mm x 27.4mm, it is large, yet slender and accords a comfortable fit. Three gadroons feature above the dial with a further three beneath the glass. These parallel lines have graced the cases of numerous Reverso watches harking back to 1931 and are part of the Reverso’s DNA. The unique swivelling case consists of over 50 pieces and, from experience, I know it works with faultless precision. 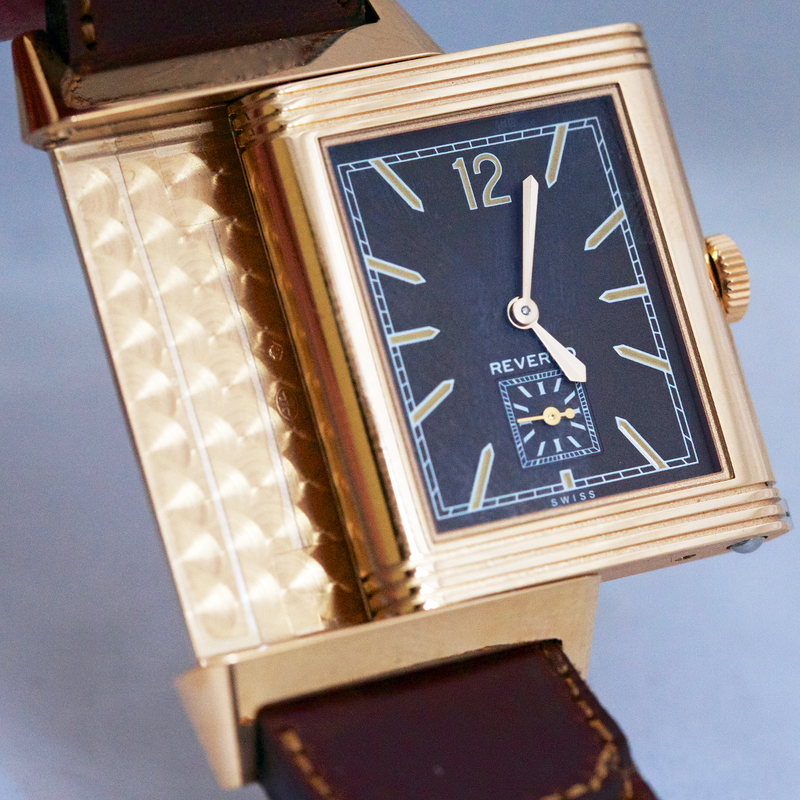 Arguably one of the wonderful aspects of the Reverso is the solid case back which graces the iconic watch. Originally, as stated earlier, it was created to shield the watch on India’s polo fields and the model’s historic links with this sport have remained strong ever since. Yet, the solid case back has provided another attribute which provides a further point of differentiation, the opportunity for personalisation. The Swiss maison has a long tradition of personalising the legendary Reverso with a family crest, a loving inscription or cherished motif. The artisans based at Le Sentier, use merely a burin, to imbue the watch with a degree of individuality which mass produced watches often lack. By combining the timekeeping functions of a watch with an engraving on the rear, Jaeger-LeCoultre has produced an interesting juxtaposition. On one hand the dial conveys the present, but by contrast the case back recounts a moment in history which can be admired for years to come. Words are often recklessly exploited by those companies wishing to purvey the ordinary. “Icon” is a term which is frequently used without justification, but in this instance the Reverso is worthy of the descrption. I have purchased three Reverso models in my lifetime and foolishly parted with them only to regret it at some stage later. However, maybe it was fate conspiring to prepare me for this delectable horological delicacy, which in my opinion, is the finest example of Jaeger-LeCoultre’s iconic model. • Case: 18-carat pink gold; dimensions 46.8mm x 27.4mm; height 7.3mm; water resistant to 3 Bar (30 metres); sapphire crystal to front and solid caseback. • Functions: Hours; minutes; small seconds. • Movement: Calibre 822/2, hand-wound movement; frequency 21,600vph (3Hz); power reserve 45 hours.